The Spain international believes that the prolific attacker is already giving his all for the team and is keen to bounce back from last week’s loss. Cesc Fabregas has insisted that there’s no truth in the rumours suggesting a number of Barcelona players are unhappy with Lionel Messi’s contribution to the team. The Blaugrana have come in for criticism in the wake of their 3-1 La Liga defeat against Real Sociedad last weekend and Messi has not escaped some harsh words either. 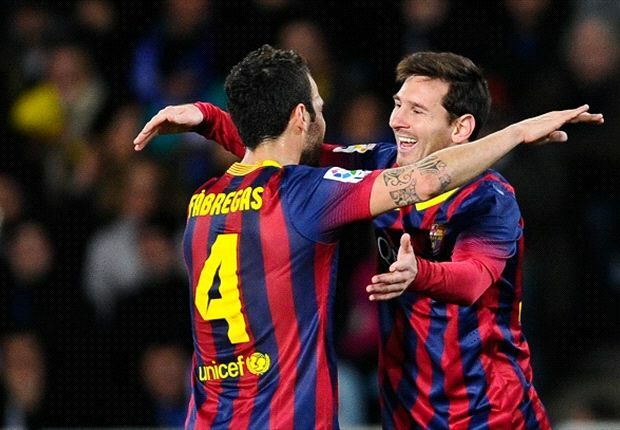 Nevertheless, Fabregas has stressed that everybody at Barca is happy with the Argentine’s hard work for the team and says the entire squad are hoping to make amends for losing their last match. “If there’s any player that carries the weight of the team on his shoulders, it’s Leo Messi. If more has to be asked of him, then three times as much has to be asked of us,” Fabregas was quoted as saying by AS. “It’s totally false that anything has been said against Leo. He looks very good to me. Leo has been the most consistent player in world football. I have no doubt that he’ll be there whenever he’s needed. His state of mind is very good, he’s happy. Messi has netted 14 goals in 18 La Liga appearances so far this term.